"It's like High Noon without the time constraints. 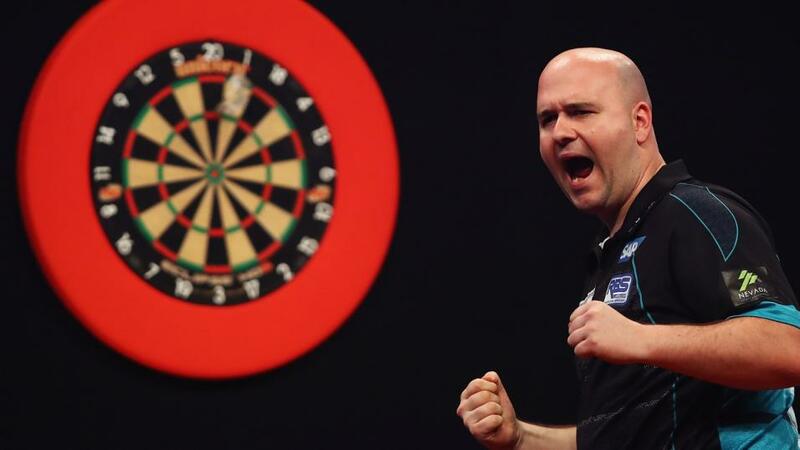 Defending champion Michael van Gerwen takes on top of the table Rob Cross. With the player ending top-of-the-pile snaffling a bonus £25,000, this is a crunch tie." Mensur Suljovic and Daryl Gurney are two of four players currently on 12 points and sit fifth and sixth, outside the play-off places on legs won. Whoever wins this match at the Motorpoint Arena would move into a play-off berth with only four rounds left to play. Neither player has reached the latter stages before. Suljovic has won four of his last six tournament matches but was well below par as he averaged only 88 in an 8-5 defeat to Gerwyn Price last week. 'The Gentle' is a tough man to back, yet unwise to take on. He makes betting on his matches a minefield as you never quite know what mood he brings to the arena. Neither man has been hurling in loads of maximums, both throwing 29 180s and both averaging around the 96-mark. Gurney drew 7-7 with James Wade last week after levelling the match with a 10-dart finish and, despite leading the head-to-head record 8-5, the draw is a definite consideration in this match between two players with almost identical records. The 8pm match sees the top two players in this season's Premier League battle it out. It's like High Noon without the time constraints. Defending champion Michael van Gerwen takes on top of the table Rob Cross. With the player ending top-of-the-pile snaffling a bonus £25,000, this is a crunch tie. MVG has won the league element of the tournament in every year he has participated, dating back to 2013. He has also reached the final in each year and he will not relinquish his tendency for top spot easily. He beat Michael Smith 8-3 last week as he averaged 109 to make take his tournament average to 101, one more than Cross. But this is a major opportunity for Cross who currently heads the world number one by one point. Cross has won seven of his last eight matches in the Premier League and with four rounds to play after this one, could open up a gap at the top with a win. When the top two ranked players in the tournament, and world rankings, met in Dublin in round three, MVG won comfortably 7-2. MVG leads the encounter 5-0 in the Premier League and 13-3 in all matches played. That said, I'm with Cross to take this one. Welshman Gerwyn Price will have the crowd behind him as he takes on bottom of the league 'Bully Boy' Michael Smith. Smith was the beaten finalist last season and my tip to upset MVG this year, but he has underperformed since he made the World Darts final at New Year. 'The Ice Man' has grown accustomed to playing the pantomime villain recently, will step out with the vast majority of the Cardiff public on his side. Currently in fourth, Price knows a win in Wales will go a long way to securing him a play-off berth. The table is so tight a defeat would be a major blow. Smith has only won three of his 11 matches so far, although the last one was a 7-5 defeat of Price in Rotterdam. A defeat in Cardiff would effectively spell the end of his hopes of reaching The O2. The only stat on his side is that in 17 previous matches, Smith leads 12-5. This is a great opportunity for the Welshman to take the points. Price has notched a tournament high 37 180s in this year's event. Peter Wright has experienced a frustrating campaign so far, often getting into matches but not getting across the line. He's taken five draws and only two wins and lays three points off the top four. 'Snakebite' has no margin for error if he is to progress to the latter stages. The Scotsman lost 8-5 to Rob Cross last week but averaged 100, a marked improvement on his recent efforts. In 35 matches against Wright, James Wade has taken 18 wins to his opponent's 17. James Wade won both Players Championship events in Barnsley last weekend and has been one of the strongest players recently. He is in third place on 12 points but has only won one of his last six Premier League games. Despite that, he's in great form and he's almost impossible to back against.